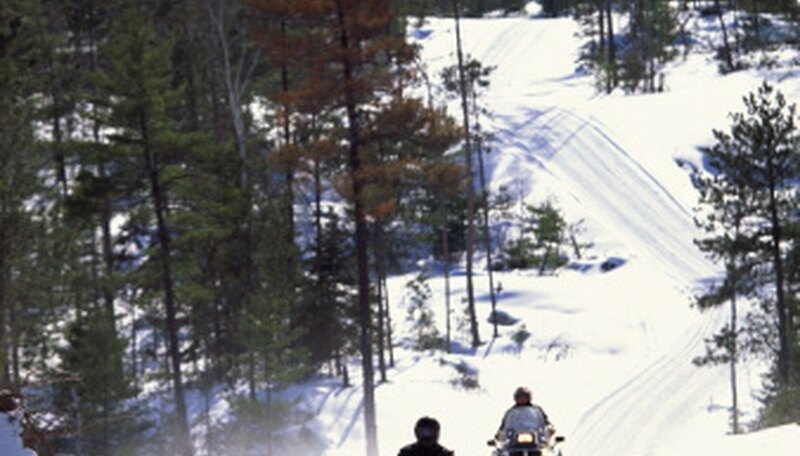 Yamaha is one of the big four snowmobile manufacturers, along with Arctic Cat, Polaris and Ski-Doo. Currently, all Yamaha snowmobiles are manufactured with four-stroke, fuel-efficient engines. Yamaha makes specialized types of snowmobile for different environments: Trail, Cross Country, Mountain and 2-Up Touring Utility. The current models include Apex, FX Nytro, RS Vector GT and RS Venture. However, there is still a lot of interest in older models, such as the SL-351, GP 292, Phazer and Phazer II. According to Popular Mechanics magazine, the 1968 SL-351 has a 350-cc motorcycle engine that produces 23 horsepower at 6000 revolutions per minute. The engine uses a looped scavenged system and has an automatic rewind manual start. This model was the first to use a metered-oil system (oil and gas separate). The SL-351 runs on 15-inch wide tracks, which are rubber reinforced with steel. Weighing in at 320 pounds, the SL-351 was originally priced at $975. Reviewed in 1973 by Popular Science magazine, the Yamaha GP 292 was one of the few remaining snowmobiles at the time with a single-cylinder engine. Capable of 27 horsepower, it needs no oil and fuel pre-mixing, having a fuel-injection system. With the GP 292 came the introduction of a new slide-rail suspension which would become a key feature of Yamaha models. The 1984 Phazer has a 485-cc, twin-cylinder, 29.6-cubic-inch, fan-cooled, oil-injected engine. The Phazer has telescoping-strut suspension and an anti-sway bar system. A handlebar-mounted fairing replaced the usual integral cowl, bringing the windshield closer to the driver. As the headlight is in the fairing, it always points in the direction the driver wants to travel. The original price of the Phazer was $3,299. Phazers were made until 1989. Then new models were introduced, such as the Phazer II and Phazer Deluxe which lasted until 2001. Yamaha released a new Phazer in 2007. As reviewed by Popular Mechanics, the 1990 Phazer II has a 485-cc Yamaha Twin engine capable of 53 horsepower and can travel at 80 to 85 miles per hour. It features T.S.S. (telescoping strut suspension), similar to a motorcycle fork, to reduce drag. It is 103.5 inches long, 32 inches wide and weighs 406 pounds. The track length is 6 feet 6 inches and it is 15 inches wide. The Phazer II can carry 8.2 gallons of fuel. Its original price was $4,549.